The reflection of me in her metallic bonnet seemed to project my weary state of mind. The red hue of my sunburn could be seen contrasting with undamaged parts of my pale skin. The mirror image projected from the overlaying pieces of metal upon her head made my lanky body appear to double in size as if I was meandering through a carnival fun house. As she pursed open her lips black teeth jutted out, bearing more resemblance to sharp obsidian shards than incisors. 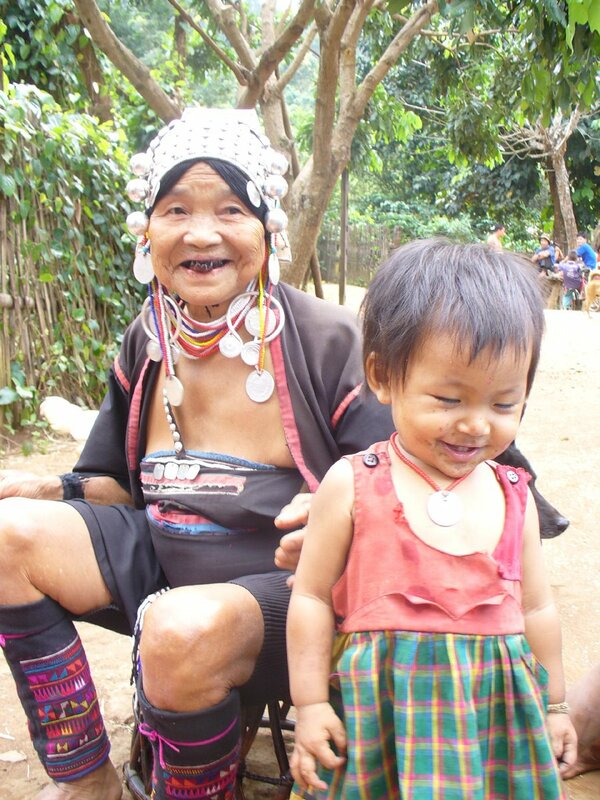 In the northern Akha hill tribes of Thailand, black teeth are considered as beautiful as white diamonds. The shiny metallic necklaces and hats they adorn themselves with are worn to trap the spirits around them and ward of those who mean harm. Deep in the humid jungle an hour drive north of the city of Chiang Mai in northern Thailand, near the imaginary Burmese border (there are no roads between Burma and Thailand in this region), I began my trek amongst the two hill tribes that populate the region, the Akha and the Karen. Along with several other backpackers and a Karen translator, we made haste towards the humid rolling hills of the north. Your quintessential travel package will take you on a three-day, two-night hike around the northern hills. These packages come in various lengths depending on your contacts in Chiang Mai. The area surrounding the Golden Triangle, a border touching Burma, Thailand, and Laos — infamous for trafficking an insurmountable amount of controlled animals, drugs, and weapons — is inhabited by various hill tribes that exist far from traveling interlopers and the paved roads of Bangkok. The men farm rice and other remedial crops in the surrounding valley while the women stay at home and craft various trinkets for tourists and barter. Their homes are made out of sticks, hay and assorted foliage. 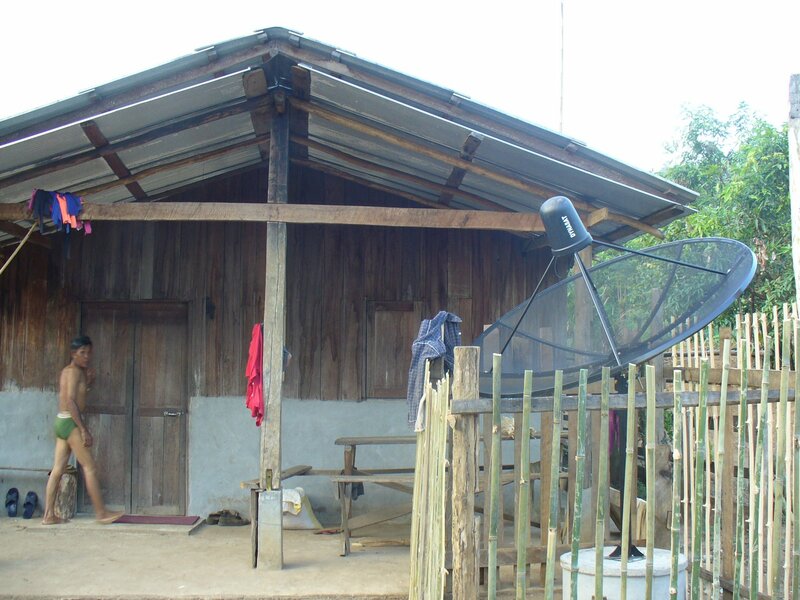 The interior is furnished with little more than a bamboo mat and fire pit, which is dug into the dirt floor. Yet, perhaps unsurprisingly, the Akha people have found solace in their traditional way of life and are never timid to show a pleasant smile of black teeth. There life in the tropical hills of Thailand is peaceful, beautiful and free of the noise and destruction that accompany the modern world. “3T,” the old woman with the metallic bonnet beckons to me. She is holding a plastic basket with assorted hand crafted necklaces and bracelets. “3T, 3T,” she continues. Our Karen tour guide leans over to me and chuckles, “Don’t you understand? 3T. Just like 6T, 7T, 8T.” She was naming her price. “Ok, I’ll take a bracelet for 3T baht,” I said, handing her over my money. While in the land of spices and smiles it is hard to turn down a home cooked meal. The egg noodle and chicken dinner we ate that night offered a more disconcerting salty side to the stereotypical spice of Thailand. Perhaps it would have been better had the family members of the deceased chickens not been walking around us as we ate. The best way to get from the Akha hill tribes to the mountainous region of the Karen hill tribes on the Burmese border is by elephant. The seats mounted on the back of these beasts of burden are generally so loose that those whom aren’t equipped with a strong stomach and sense of adventure find this task a bit daunting. As our caravan of elephants paraded into the Karen hill tribe, a group of young boys ran along side us with the shadows of their flailing hands dancing on the dirt street. The Karen hill tribe was much bigger than the Akha’s, and it had one or two small huts that were distinctly marked as small odds and ends stores. From the outside you could see little bags of tomatoes or garlic hanging above the counter. As the elephant sat down to let us disembark, I noticed something extremely out of place in this village. Connected to the hut right beside me was a giant satellite dish. This particular house had no door that I could see so I decided to take a peek in. Here in the mountainous regions of Thailand, a family living in a hut with no plumbing or formal insulation was watching Oprah on satellite television. The satellites were all gifts from Prime Minister Thaksin Sinawatra, a present that guaranteed loyalty from a group of people out of touch with the politics of Bangkok. PM Thaksin also gave each village a cell phone to promote business and establish communication. Though very similar in culture, the Karens differ from the Akhas in a few distinct ways, including their lack of any metal clothing. 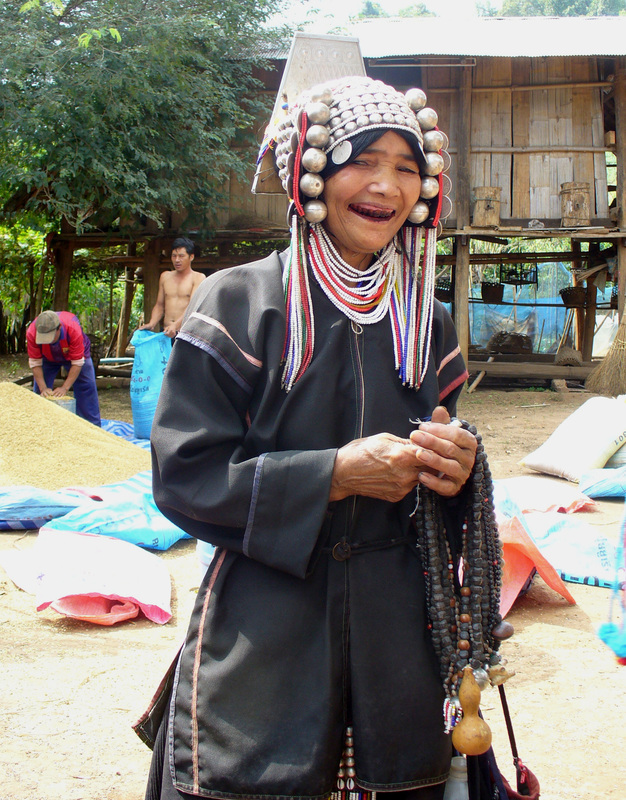 The Karen and Akha people speak completely different languages and Karen women seem to be more interested in making long elaborate weaves than spending their time talking to tourists. A banner of PM Thaksin hung over one such woman as she toiled away in the heat over a rusty spinning wheel. It was the first time I had seen a spinning wheel outside of a picture from a fairytale or museum. 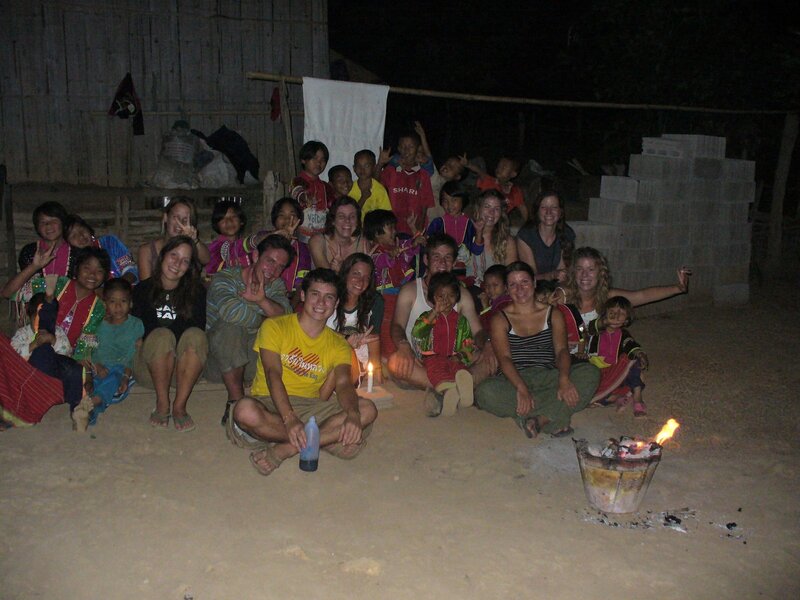 That night all the children of the Karen village came to sing a song to welcome all their new visitors. They wore red gowns with laced ribbons sown into them and sung in a forgotten language few ears have heard on this planet under a stainless starry sky. With the Karen lullaby echoing in my ear, I fell asleep in hope that I could keep the peacefulness of the hill tribes in my mind and return to it whenever the bustle of the big city got in my way. The beauty in her black teeth wasn’t apparent then, but now it all makes sense. The beauty was always there, in her smile.